at Whitehall, now the Flagler Museum. French academic painter William-Adolphe Bouguereau (1825 - 1905) is widely admired for his delicate figure studies that capture even the most subtle human emotions. Immensely popular in both Europe and America during his lifetime, Bouguereau became one of the most prolific and influential artists of the nineteenth century, and is today widely recognized as one of the art world's great painters. Bouguereau's 'Fancies' will feature nineteen mythological and allegorical paintings and drawings spanning the artist's entire career, in addition to period reproductions of his works in print, porcelain, marble, and bronze. Bouguereau's works embody values such as equality, charity, and respect for the humanity and dignity of mankind. Some of his most popular works depict noble peasants, particularly young women and children. His paintings are more than just exacting figure studies however; Bouguereau sought to convey intense emotion and meaning through his figures. Mythology and fantasy were also favorite subjects of Bouguereau - he referred to these works as his "fancies" - and he often populated his paintings with attractive nymphs, cupids, satyrs, and toga-clad men and women. The artist also often chose to elevate figure studies to allegorical works, which provided the opportunity to embody his audience's aspirations or values in a single, beautifully portrayed figure or group of figures. While mythological and allegorical subjects enhanced the appeal of his figures to the public, they also provided Bouguereau with endless opportunities to create beautifully painted and charming human figures. A highlight of the exhibition was the display together, for the first time ever, of three versions of the artist's Jeune fille se dèfendant contre l'Amour [Young Girl Defending Herself Against Eros]. Created in 1880 for the annual French Salon, the full-sized version of this subject - a girl chastely resisting first love - was once owned by Henry Flagler and hung at Whitehall (now the Flagler Museum), and is currently in the collection of the University of North Carolina at Wilmington. The Salon version was united in the exhibition with the artist's reduction of the subject, once owned by Henry Flagler's friend Henry Walters of Baltimore and lent by the J. Paul Getty Museum, as well as a chalk and gouache drawing of the same subject from the Fine Arts Museums of San Francisco. 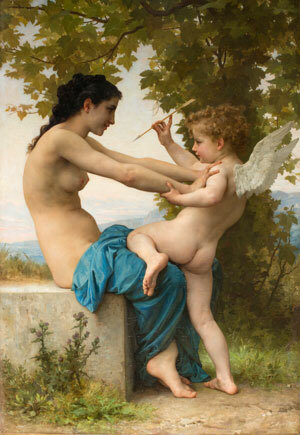 Bouguereau's 'Fancies' also examined the rise and fall in the market for Bouguereau's work. While Bouguereau's paintings were eagerly collected by the wealthy, new commercial reproduction methods provided more affordable versions, contributing to the artist's popularity. Bouguereau's Salon paintings were quickly reproduced in marble, bronze, porcelain, and as prints. His work was enthusiastically sought by Europeans, but many of Bouguereau's most dedicated collectors were in North America. Bouguereau's 'Fancies': Allegorical and Mythological Works by the French Master was organized by the Flagler Museum. Palm Beach Daily News - "Bouguereau's 'fancies' were 19th century's blue-chip art"
Palm Beach ArtsPaper - "The first glimpse of Jeune fille se défendant contre l'Amour (Young Girl Defending Herself Against Eros) can leave us speechless." 12:15 p.m. and 2:45 p.m.
Join Flagler Museum Chief Curator Tracy Kamerer for a tour of the Winter Exhibition, Bouguereau’s ‘Fancies’: Allegorical and Mythological Works by the French Master. 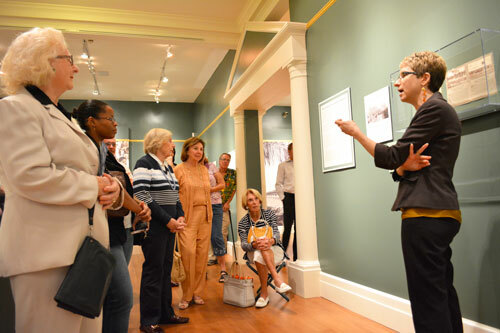 Ms. Kamerer will guide visitors through a collection of paintings and drawings by Bouguereau, as well as popular period reproductions of his most famous works in print, porcelain, marble, and bronze.